Altoona is a city in Blair County, Pennsylvania, United States. 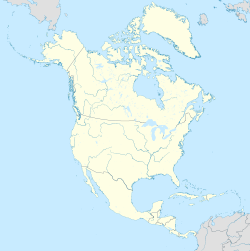 It is the principal city of the Altoona Metropolitan Statistical Area (MSA). The population was 46,320 at the time of the 2010 Census, making it the eleventh most populous city in Pennsylvania. 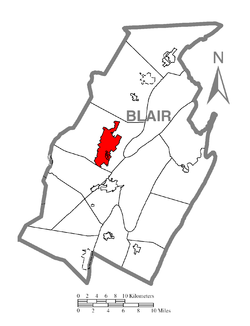 The Altoona MSA includes all of Blair County and was recorded as having a population of 127,089 at the 2010 Census,  around 100,000 of whom live within a 5-mile (8.0 km) radius of the Altoona city center according to U.S. Census ZIP Code population data. This includes the adjacent boroughs of Hollidaysburg and Duncansville, adjacent townships of Logan, Allegheny, Blair, Frankstown, Antis, and Tyrone, as well as nearby boroughs of Bellwood and Newry. Having grown around the railroad industry,  the city is currently working to recover from industrial decline and urban decentralization experienced in recent decades. The city is home to the Altoona Curve baseball team of the Double A Eastern League, which is the affiliate of the Major League Baseball team Pittsburgh Pirates. The 90-year-old Altoona Symphony Orchestra,  under the direction of Maestra Teresa Cheung (since 2007) has been calling Altoona home since 1928. Prominent landmarks include the Horseshoe Curve, the Railroaders Memorial Museum, the Juniata Shops of the Altoona Works, the Mishler Theatre, the Cathedral of the Blessed Sacrament, and the Jaffa Shrine Center. The Altoona Mirror newspaper,  founded in 1876 by Harry Slep, is Altoona's oldest media outlet. Today, the newspaper has a daily circulation of 32,000 and a Sunday circulation of 39,000. Approximately 13,000 people read the online edition of the newspaper each day. The downtown is the cultural and commercial center of Altoona and straddles the famous railroads. As is typical to a traditional city layout, the downtown is centrally located and contains significant development in all directions from the downtown. Much of the downtown area is listed on the National Register of Historic Places as the Downtown Altoona Historic District. Popular landmarks include the Mishler Theatre, the Penn Alto Building (formerly the Penn Alto Hotel), the Gable's Building, City Hall, the Cathedral of the Blessed Sacrament, and Eleventh Avenue itself. The United States post office in Altoona contains two oil-on-canvas WPA commissioned murals painted by Lorin Thompson in 1938 titled Pioneers of Altoona and Growth of the Road. Murals were produced from 1934 to 1943 in the United States through the Section of Painting and Sculpture, later called the Section of Fine Arts, of the Treasury Department. 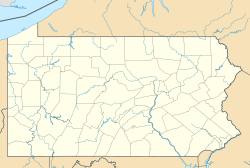 Juniata is defined as north of Juniata Gap Road, east of East 25th Ave and on the west side of the railroad line. The area is zoned as mostly residential limited, but also uniquely has a significant area of light and heavy industrial as well as a central business area. This is because Juniata was once its own city, and was incorporated into Altoona in the late 19th century. Because of this, the section's street names had conflicting numbers with the rest of the City, and had to be given a North prefix. The commercial area is sometimes nicknamed "downtown Juniata." The most important street in Juniata's L-shaped commercial district is North Fourth Avenue. The J.L. Noble School was added to the National Register of Historic Places in 1996. The original Thompson's Pharmacy was on 2nd Street in Juniata before moving a few blocks to a larger main store and branching out to become a small, local chain. The Knickerbockers are a unique collection of homes along 6th Ave between Burgoon Road to the north and 41st Street to the south. The Knickerbocker Historic District was added to the National Register of Historic Places in 2002. This collection of extremely closely built together homes are a local landmark, and the Knickerbocker Tavern is one of the most popular bars in the area. As of the 2010 census, the city was 93.8% White, 3.3% Black or African American, 0.1% Native American, 0.4% Asian, and 2.0% were two or more races. 1.3% of the population was of Hispanic or Latino ancestry. The 2000 Census reported the following predominate ancestry/ethnicities: German (35%), Irish (17%), Italian (12%), English (7%), Polish (4%), Black or African American (2%), Dutch (2%), Scotch-Irish (2%), French (2%), Scottish (1%), Pennsylvania German (1%), Welsh (1%), Swedish (1%), Slovak (1%). As of the census  of 2000, there were 49,523 people, 20,059 households, and 12,576 families residing in the city. The population density was 5,069.7 people per square mile (1,957.1/km²). There were 21,681 housing units at an average density of 2,219.5 per square mile (856.8/km²). The racial makeup of the city was 96.01% White, 2.49% African American, 0.10% Native American, 0.32% Asian, 0.02% Pacific Islander, 0.24% from other races, and 0.83% from two or more races. Hispanic or Latino of any race were 0.74% of the population. Altoona is the home of the Sheetz headquarters. Sheetz is one of the largest convenience store and gas station chains in the country,[ citation needed] with 500 stores in Pennsylvania, Maryland, Ohio, West Virginia, Virginia, and North Carolina. Approximately 20 Sheetz stores  are located in and around Altoona. As typical of many Rust Belt cities, the economic downturn of the railroad resulted in the closure of many of the downtown's landmark stores and industries; and the simultaneous rise in prominence of the automobile shifted commercial development to the suburbs. However, through recent revitalization efforts, Altoona's downtown maintains a significant level of economic vitality and hosts few office and residential vacancies. [ citation needed] The downtown maintains a significant focus on pedestrian-oriented development, as evidenced by the presence of more pedestrian bridges and underpasses across the railroad tracks (connecting the two parts of downtown) than automobile crossings. In the early 20th century, the Pennsylvania Railroad constructed a large sports complex at the intersection of Chestnut Avenue and Seventh Street. It was named Cricket Field in an attempt to appeal to Cricket-loving British investors. Cricket did not catch on with the Altoona populace, so its close relative baseball became the choice for Cricket Field. Well known baseball players as Babe Ruth and Josh Gibson played at Cricket Field, and the stadium was also the venue for numerous other sporting events, musical competitions, marching units, and activities. A plaza that's home to; Wendy's, Rite Aid Pharmacy and the Pennsylvania State Parole & Probation, stands today on the site of Cricket Field. Altoona was the site of a 1.25-mile (2.01 km) board track called Altoona Speedway from 1923 to 1931. On June 15, 1929, just two weeks after winning the 1929 Indianapolis 500, Ray Keech was killed in an accident at the Altoona Speedway. Altoona has an education system that contains three high schools, two parochial, one public. Bishop Guilfoyle High School is one of the private parochial school having grades 9–12. Great Commission Schools is the second private parochial school having grades K–12. Altoona Area High School  houses grades 10–12. Altoona High is much larger than Bishop Guilfoyle, graduating around 600 students annually, while Guilfoyle graduates around 100. The Altoona television market is part of the regional Johnstown/Altoona/ State College market. ^ Mandak, Joe. Associated Press, April, 26, 2011, " Altoona, Pa., changes name to Spurlock movie title". Accessed February 27, 2019.